20.00 The magician shows a twelve inch red silk handkerchief. The hank is ordinary and completely ungimmicked. He starts poking the hank into his closed fist and talks about how Christ Jesus forives Sin. Isaiah 1:18 says, "Though your sins be as scarlet, they shall be as white as snow. Though they be as crimson, they shall be as wool." When the white hank is poked in about half way, the magician reaches under the fist and pulls half-way into view a red handkerchief! Apparently the white hank is changing color as it is pushed and pulled through the closed fist. The last half of the white hank is pushed into the fist and it it exits out the bottom of the hand completely red. The suspicious closed fist is opened and the hand is completely empty! This is a visual, direct, and straight-forward way to do the color changing handkerchief effect. Created by Bruce Chadwick and later pirated under the name "Eclipse," the outfit comes complete with two handkerchiefs, instructions, and that necessary something. 8.00 DISSOLVO PAPER looks like normal paper, but disintegrates when put into water. The classic use is to have a spectator write one of his sins on the paper, and then put it in a clear glass and cover it with water. As the water is poured back and forth from one glass to another, the paper vanishes before everyones eyes. A very powerful and dramatic effect. Comes with instructions and routine, plus some ideas for performance. Three 8 1/2" x 11" sheets, enough for up to 36 performances. 7.00 This is a great torn and restored paper trick made famous by the late Karrell Fox. The magician displays a strip of paper with the phrase "FRESH FISH SOLD HERE." He discusses the redundancy of the words and tears away the word "HERE." 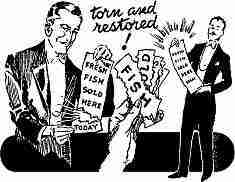 Likewise the other words "FRESH and SOLD" are systematically torn away leaving only the word "FISH." Not descriptive enough concludes the magician and he unfolds the torn pieces to once again display the full title "FRESH FISH SOLD HERE!" 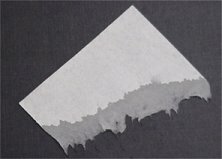 A great torn and restored paper tear effect. Comes complete with enough tears for twelve performances. Climax your presentation with the scripture verses and explanation where Jesus said, "Come and I will make you fishers of men." 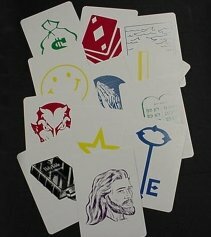 25.00 This is a great beginner kit for the adult or child who wants to learn how to use illusions to do evangelism and proclaim the Gospel of Christ. The kit provides effects that parallel the Roman Road to Salvation. 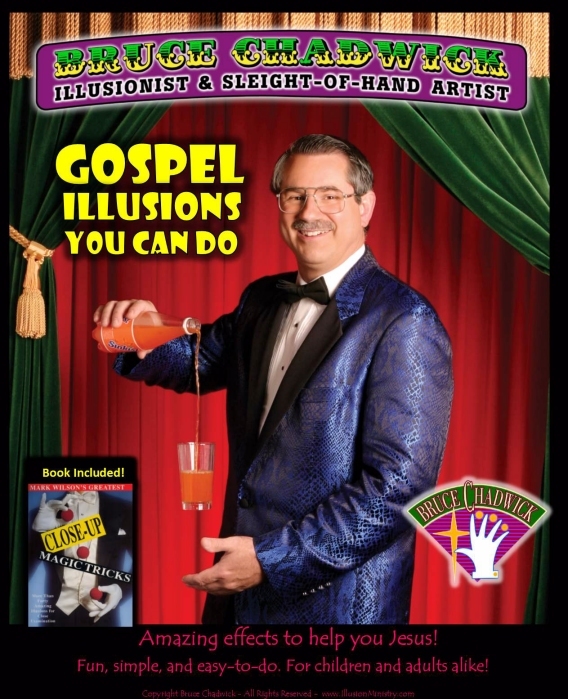 The illusions can be performed individually for "out of the pocket" types of witnessing situations, or used together to present a larger program. 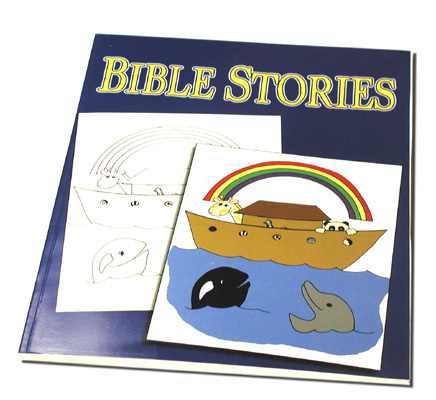 Not only for use in one-on-one witnessing situations, the kit is also great for Sunday Schools, children's church, and other group gatherings. The set comes with complete instructions and performance tips. A Mark Wilson Close-Up Magic book is provided at no additional charge. 15.00 Eleven cards are displayed before the audience. A spectator freely chooses a number between one and ten. His number is used to select and mark a card for future reference. 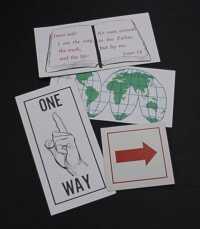 Each card is turned around revealing ideas about what some people may think it takes to get to heaven. 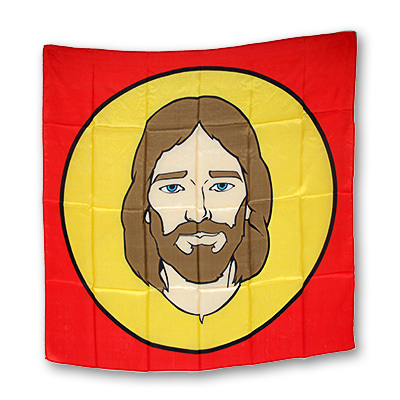 Finally the card marked as the spectator's choice is turned around to reveal the Christ Head Card. The spectator's choice is the one and only correct KEY TO THE KINGDOM. If you are looking for a strong trick that could be your entire sermon, this is it. Highly recommended and not difficult to do. Each card is approximately 4 1/2" x 7" in size. 10.00 Three playing cards are shown. Two spot cards and a "King of Hearts" in the center. When you lay the three cards face down on the table, you have a spectator put his finger on the "King of Hearts" or the center card. 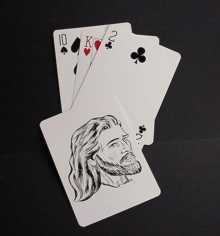 When this chosen card is turned over it reveals a picture of the head of Christ! So who is the King of your heart? 20.00 The magician displays two white and black loops of chain. He loops the chains together with the black one hanging around his wrist and the white one hanging from the black chain. The top black chain represents spiritual darkness, the spiritual condition of man in his sin. 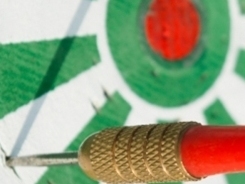 Sin of course is properly defined as "missing the mark." The bottom white chain represents spiritual light and the eternal salvation God offers through trust and faith in Jesus. The magician grabs the top chain and pulls downward. Instantaneously the chains magically switch places! By putting our faith and trust in Christ, our sin problem is eradicated so that we may have eternal life! This is an excellent and effective method of sharing how Jesus paid the price for man's sin.